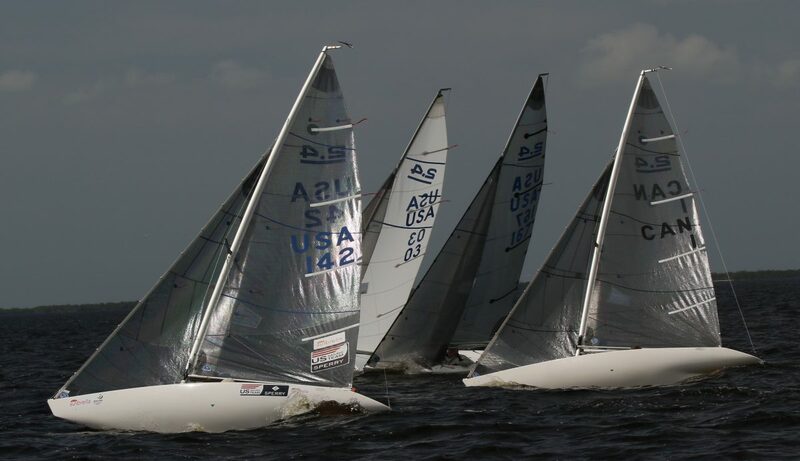 Port Charlotte, Fla. (February 27, 2019) – Can Am #4, the penultimate regatta of the five-event 2019 2.4mR Can Am Championship, saw 20 competitors – the largest fleet of the season – get to work on the waters of Charlotte Harbor from February 22-24. Although missing veteran 2.4mR class competitors Janice Graham-Foscarini, Louise Anstey and Audrey Kobayashi, the addition of Guatemalan racer Rodolfo Quezada; the three Massachusetts sailors (Jerry Blouin, Shan McAdoo and Doug Trees) who are building a new Marblehead-based 2.4mR fleet; and class newcomers Geoff Moehl of Orlando and Patrick Reiss of Bonita Springs, made for an exciting weekend of racing. The races on day one started in an eight-knot southeasterly breeze which died near the end of the first race, forcing the race committee to postpone racing for an hour. With the racecourse relocated to the west, a light sea breeze filled which allowed the second race to be completed on a rising tide. By the third and final race of the day, the southwesterly had built to 12 knots. Three sailors from Canada dominated the day, with Allan Leibel of Toronto winning the first race, Peter Eagar, also from Toronto, winning race two and British Columbia’s Bruce Millar winning race three. The Race Committee had less than five knots to work with as they set up for the planned three races on day two. However, once the new line was set after a shift in wind direction and subsequent relocation of the course to the west, the southwesterly breeze built into the mid-teens for the remainder of the day. The relatively minor oscillations provided few opportunities for competitors that needed to overcome bad starts. Leibel, who represented Canada in the 1972 and 1976 Olympics (in the Dragon and Tempest, respectively), crossed the finish line first in all three of the day’s races to win the event. 2018 2.4mR North American Champion Dee Smith of Annapolis, Maryland, placed second with 11 points, three points behind Leibel. Millar, winner of the Edge Sailing Midwinters in January, finished in third with 12 points, followed by Tony Pocklington, of Fort Myers, Fla., fourth overall with 17 points. Charlie Rosenfield of Woodstock, Conn., completes the top-five with 27 points. Full results for Can Am #4 may be found here. The third edition of the 2.4 Meter Can Am Championship series will conclude with the nine-race 2019 CanAm Championship Finale, from March 29-31. The series champion will be determined from the results of all five regattas after his or her worst event is dropped from the scoring. For competitors who did not race in all five events, the scoring will count all events sailed (i.e. they will not drop their worst result). Details of the regatta schedules, social events, hotels and more may be found in the Notice of Race, available here. Full results for the 2018 2.4mR North American Championship may be found here; and for the 2018 2.4mR U.S. Nationals, results may be found here. Full results for the 2019 Edge Midwinters may be found here. US Sailing Association recognized its 2018 Community Sailing and One Design award winners January 31st, 2019, for their contributions to the sport of sailing in the United States during the 2019 National Sailing Programs Symposium (NSPS) in Jacksonville, Florida. Community sailing advocate, and former US 2.4mr class President Dennis Peck received the Volunteer of the year award. Dennis Peck has been the President of the Charlotte Harbor Community Sailing Center since 2003. He volunteers his time at three to four summer camps each year and acquires donors for children who need financial assistance. Peck is constantly repairing boats or trailers or doing whatever else needs to get done to keep the program moving forward. He works tirelessly to get donated boats resold so that the funds can support the insurance and resource needs of the Center.